The number of cast on stitches should be a multiple of 12 plus 3. Repeat rows 9 through 32 until blanket is desired length ending with a row 32. Then work rows 1 through 8, cast off, finish off, secure and weave in end. At the end of the pattern, what does work rows 1 through 8, mean ? Repeat rows 1 through 8 to put a border at the end of the blanket. You mean work from rows 1 to 8? Right, work those rows at the end of the blanket to make a border at the end like that at the beginning. Thanks for the pattern and information. This blanket is on my “must knit” list. Excuse my lack of knowledge but what is “DK baby weight yarn”? DK (Double Knitting) weight is between sport and worsted weight. It is closest to sport weight but just slightly heavier. Whereas in the UK we have the choice of double knit or 4 ply. Baby wool tends to be slightly lighter than some DK yarns, but I would make this in 4 ply on 4mm needles. To find size equivalents there are many 4 ply patterns online that would give you a relative stitch count to compare with the chart above. It’s gorgeous. is the border worked into the blanket or do you have to work one after you finish knitting the main body of the blanket? It is worked as you go. WOW!!! What a great blanket for a boy. Just what I have been searching for. I am going to start this today. I will be making one change for the largest size it will be in worstted weight to adjust for the Canadian weather. This is a beautiful blanket. Does the back look as good as the front? I definitely prefer the front, but the back does look nice. been looking for a nice fancy but easy pattern where i can put down & not lose off the pattern….thk ive just found it…cant wait to start it…gona start wth the smaller one as grandaughter,s want some for dolls pram!! this is perfect for warm weather, just something to use in airconditioning. Thank you. For the larger sizes, do you still use the small Size 6 needles. What happens if you use larger needles…could it become an adult sized afghan…which is what I’m needing to do. You can absolutely make this on bigger needles and use heaver yarn. You can even add cast on stitches in multiples of 12 to make it as wide as you like. I love your baby blanket and will be doing this for the baby gift. This is a beautiful blanket, its exactly what I have been looking for, will start tomorrow (right now its 11:58 midnight)will be making a White for the boy (3 mo.0ld) and somne other color for the girl,(11 mo.old. )my two great grand children. Thank you sooo very much. Beginner knitter…when you get to the “*” — what exactly am I repeating? Thanks! First do the stitches before the first *. Then do the stitches between the * and repeat those until nearly at the end of the row. Complete the row with stitches after the *. The blanket is gorgeous. Any suggestions for making it in two colors, border and raised sections in one color and surrounding area in another? Since the pattern is throughout it would have to be done in the fair isle or stranded method which would also make it thicker and the back less attractive. Since purls do not work well with color changes, I think it would have to be worked stockinette and using the second color in place of the purl stitches. I also would like to use two colors. New to kitting, what is stockinette? Stockinette is done by knitting all right side rows and purling all wrong side rows so that the front is all knits. It IS possible to work the all-around border in a contrasting colour without stranding. Intarsia. Begin with the contrast colour for the first 8 rows, then keep the border stitches on the contrast colour – separate balls or both ends of the same one – and the main colour inside that frame. It’s a good way to ‘tame’ stockinette’s curl. What would be the size for a baby blanket? A baby shower is coming up and I love the pattern! Thanks for a great pattern. It depends on its use. Swaddling and receiving blankets are usual from 30 to 36 inches square. A typical general purpose baby blanket is around 36″ by 40″. A crib blanket is about 36″ by 50″. Can i use washable merino wool or baby wool and how much yarn would i need? It looks like a wonderful pattern for a new great grand baby boy. Washable wool should be lovely unless baby has an allergy or sensativity. The ounces may differ from the guidelines in my chart since my sample was cotton, but the yardage should be fairly close. Hi follow knitters. I just want to know if this pattern is easy. I like easy patterns to do on a prayer shawls. I’ve just finished knitting the medium size for my first grandchild… a little girl and it is so beautiful when finished and is easy to knit. Once you get used to the pattern sequence it is very enjoyable to knit. I’m now going to knit the matching bonnet. I hope you give it a try… you will enjoy it. I was home from work with a broken ankle so knitting it gave me something to do and like I said the finished product is stunning. I am 1/2 way done with this one.. It is very easy, durable, and a great couch blanket. I’m anxious to get started! Have a question re/#6 needle. I’ve done other baby blankets and they take a circular needle. With so many stitches to cast on, it must take more than just a regular straight needle. You would want to use a circular for all but perhaps the two smallest sizes. I only use circulars. I packed up my straight needles decades ago. How do you cast off,finish off secure and weave in end? Hi, im only new to knitting …could you please tell me approx what ply would be the best to get for this blanket for a baby..? Not sure what that equals to “sport weight” wool. thanks!! Dk (double knit) weight is 8 ply. This is my first major (non-scarf) project and I’m still pretty new to knitting. So far its going well, I’m attempting to knit the large size blanket. But, my question is related to finishing. I’ve read about blocking and am a tad confused as to what would be best for this blanket? I’m making it in a lemon yellow dk and will have to wash it to get rid of grubby marks, so can you advise how to finish the blanket off s I’ve never done it before? This blanket should be fairly flat on its own, so after washing, you can just spread it out on towels so that it is even and let it dry. Thank you so much for this pattern. This is my first major post-scarf piece and I’ve knitted it for my nephew who’s due soon. I made a few new-knitter mistakes but I think (hope!) that will add to the homemade charm of it! I’m going to give the matching hat a go too. Brilliant pattern, really easy to follow and great final result. Thank you. Also, thank you for the website!I’m really glad and excited that I found it. I love this pattern! It is my first attempt at knitting a blanket and I’ve just begun. Thank you for the clear instructions! Again I’m sure this is a silly question, thanks in advance for your help!!!! Bind off with the row 8 so that row 8 is your last row. Could this be made in crochet cotton to be used as a tablecloth? Would be ideal for my dining room table. I would think that would work. You could try a small swatch to see if you like it. 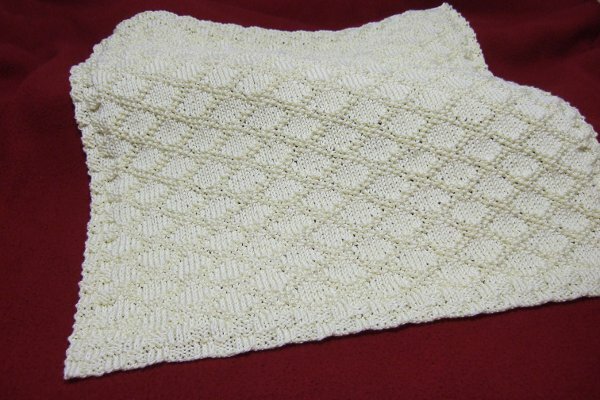 I would like to make the King Charles Baby Blanket, but with worsted weight – Bernat Premium yarn. It is suggested that I use sz. 8 needles. I would like to make a medium size blanket. I have three skeins – each 198g/7oz. Would I have enough yarn to make the medium size blanket, and if so how many stitches would I cast on. Thank you for these wonderful patterns. Cast on 123. You should have plenty of yarn. Is this afghan considered a great one for an 18yr.old grandson that is off to college? I would want him to be able to take it with him to school. I hope it is not a lacey style. Please let me know. I don’t think it is a lacy look at all. Given the right color it will look quite masculine. Sounds like a great off to college afghan to me. Thanks for this pattern – I’m adding this to my files. And thanks especially for the size/yardage chart: it would be great if more patterns were so specific with this type of info, particularly in afghan and blanket projects. What I’m saying in the red comment and the line in the pattern are the same thing. I was just clarifying how to follow the “*” section that is repeated. Im confused.. Row 9: k3, p3, k3 * k3, p1, k1, p1, k6 * p3, k3. Im knitting the small so 123 stitches.. Do i repeat the entire row this way until im finished? If i only repeat the stitches that have a * infront of them then that wont cover 123 stitches ?? Am i making sense.. So i would k3 p3 k3 do the repeated part k3 p1 k1 p1 k6 and end with p3 k3..then repeat those until the end of my stitches? I’m sorry about the confusion. The stitches between the two * are repeated. So for row 9, first work k3, p3, k3, then repeat k3, p1, k1, p1, k6 over and over until you are near the end, then complete the row with p3, k3. I like to know which is right side, the even row or odd rows? I dropped a stitch and had to take out 2 rows and now I am confused. Odd are the right side. Mine in the picture is made with cotton yarn. What weight is your yarn? The pattern includes a border of checks of alternate knit squares and purl squares that are 3 stitches wide and 4 rows high. Row 13 begins with the purl square. I wanted to say thank you for your patterns. I am knitting this for my new grandchild (not yet born!) it is a perfect design when you don’t know whether it is for a boy or girl. It is looking so lovely. Can’t wait for the finished blanket. work in making it easy. Can’t wait to start! In that situation I have either made stripes (wide would be fine) or I have used half of one color on one end, knit the middle of the other color, then use the other half of the first color on the other end. I’d love to see a picture when you are done. Oh and would I have to use smaller size needles? If you are using three strands together, you should be able to use a 6. I would think three strands of 2 ply cotton would be roughly equivalent to DK weight. Hi! I just came across your pattern and am in love. Looking at the different baby DK yarns I am a bit confused. I would like to knit the x-large which calls for 33.62 oz of yarn. The DK baby yarn I saw is 1.75 oz per skein, 160 yds per skein. Not good at math and when I try to figure out how many skeins to buy it does not come out right. When I take the 160 x 11 skeins I have more than enough yarn but using the same 11 per 1.75 oz it shows less than what your pattern calls for. Can you please help me? Since you are using a DK weight yarn and yardage is given on it, just go by the yardage and don’t worry about the the ounces. Ounces will vary by the content of the yarn. I especially like that I do not have to knit and knit a border. That once it is finished it is that. No knitting for metres and metres on a few stitches. Love the pattern. Thank you so very much for this lovely pattern! If I want to make this blanket with a seed stitch border, how would I go about making the necessary change(s)? Thanks again! Thank you so very much! I’m new to knitting and could use all the help/advice/guidance I can get! I’m sure my baby boy is going to love this! Thanks again! This is a beautiful blanket,I’m planning to make the extra small using simply soft 100% acrylic will one strand work okay? Also would like to make the extra large,(IF THE EX SMALL turns out right)how many strands should I use? I’m fairly new at knitting have made the basket weave preemie blankets. But with your directions and chart this looks like one I can master. Yes, I would use a single strand in both cases. I made this afghan and it is lovely. I would like to make a baby cardigan, possibly hooded, to go with it – i.e. same pattern. Is there such a pattern out there for me? Would I cast on 147 for a medium? That will be a little larger than the dimensions given. If you want to keep to the medium dimensions, cast on 135. Absolutely gorgeous! Knitting afghans for future grandchildren (hopefully I am still alive :-)), However I seem to have a problem purchasing DK yarn here in the USofA. Ordering same from a well known knit/crochet/craft online and hard catalogue I was sent sport. It simply does not give the effect DK gives. Anyh advise? What makes it confusing is that many view DK and sport as interchangeable, so sometimes yarns are misnamed. I have seen several yarns called sport on the label but are actually DK. You might look at yarns you are interested in on http://www.ravelry.com to see what weight the yarns are given there. There are also sometimes comments on yarns there that might be helpful. Hi Mom. This blanket is beautiful. It’s definitely on my list. And I’m anti baby colors, so I’ll be all over the color spectrum. Do you have any of your patterns in PDF so I can save them in Adobe Reader?? It would be easier to save them that way than to have to copy/paste. Thanks so much. There is a button at the top of each pattern that will create a PDF of that pattern. Hi there – what a beautiful pattern! I want to knit my new granddaughter a blanket for Christmas, and I have 600 yards of the most beautiful cashmere worsted yarn. I’m thinking of using smaller needles (maybe 4’s?) to compensate for the thicker yarn, and I want to make it as big as possible. Do you think this will work? Thanks so much for sharing your patterns and for any advice you can offer. To make it as large as possible use the size needle called for on the yarn (maybe an 8 or 9?). With that yardage, cast on for a small, but hopefully with the heavier yarn and bigger needle size it will be somewhat larger. I’m also having a problem with row 10. When I come to the last pearl 5 I seem to have 2 extra stitches before the k3, p3. Tried it 3 times , still have an extra 2 stitches. Any suggestions? That was the only obvious place I could see possibly missing 2 stitches. Row 10 definitely has the same number of stitches as row 9, so if row 9 worked, you have the correct number of stitches before beginning row 10. I am knitting and selling baby blankets to fund my way through college. I wondered if you would allow me to use your pattern for one of the blankets, I will of course, put in a leaflet advertising your website and stating that the pattern is your design. Sounds fantastic. You have my blessing. Thanks for asking. New to this can the DK be cotton mix, going to do this for my 1 year old grandson, he likes to cuddle in a blanket, what size do you suggest. and how many grams of wool. Cotton mix would work great. I would suggest a medium or large. The medium would take 545 grams. The large would take 735 grams. I’m a relatively new knitter. Do you think I could adapt this beautiful pattern into a shawl? I just love it and was looking for something on the easy side but not boring. Did you want a rectangular shawl, or some other shape? That is the yardage for the extra large size. It takes 33.62 ounces, which would be 953 grams, so 10 of that size ball of wool. Hi I was wondering if I could use Bernat Baby Cakes Yarn which is 50% cotton and 50% Acrylic and it is 4 Medium weight yarn to make this blanket and also the textured Baby Hats ? If so what size needle should I use ? Please advise ! Thanks ! That yarn is what I would actually call a light worsted. They are recommending a 7 needle, so only one size larger than the recommendation on DK, and the gauge is 20 stitches per 4 inches vs 22 stitches per 4 inches on the DK. I don’t think that is a material enough difference to matter much. I think these would look great in that yarn. Thank you so much for this pattern and answering my question I am now ready to start making this blanket ! Have a great day ! I am using 6mm 10US circular needs and medium 4 yarn. Having a problem with turning knitting when I have finished row. I keep knitting wrong side (purl side) on knitted side. How do I prevent this from happening? I may not have understood what is happening, so let me know if I’ve missed it here. It sounds like the beginning of your row and end of row are together on the needle because it’s a circular needle, and you are forgetting to stop when you get to the end of the row and flip the work before continuing. So it sounds like you continue on to the other side with the next rows instructions as though you are knitting in the round. If I’m understanding correctly, I think you just need something that will be a reminder at the point where they meet. I don’t think a stitch marker would do it, because I often mark the round beginning with a stitch marker when knitting in the round. But I think you could use something else like a stitch marker, something bigger, and obviously something you normally wouldn’t use knitting – anything round with a hole big enough to fit easily over your needle. It can be bigger than a stitch marker because it’s not actually going between stitches and won’t stretch your work. Hi, I use 2 things a washer from my husband’s garage and a large safety pin, I use the round circle on the end. What does “the number of cast on stiches should be a multiple of 12 plus 3″ mean. I give that information for anyone that might want to modify the pattern or make a size other than those I have given. With R repeats of the pattern, cast on 12 x R + 3. This beautiful going to knit one right away. Thanks for the pattern. Can I just confirm that the first 3 and the last 3 stitches form the border, I was thinking of doing a narrow garter stitch border all around and maybe doing a crocheted scalloped edge. There are 6 stitches on each end for the border. The border is 3 stitch by 3 row alternating knit and purl squares. I have nearly finished the blanket and would like to knit the hat to match. Is it possible to knit the hat on ordinary pins? I would be very grateful if you could give me the pattern for the King Charles hat with straight pins. I would love to make this blanket for my grandson. I am using Bernat pipsqueak bulky 5 and it says use needle 9, 11sts. I would like to make a large blanket. What size needles would I use and how many would I CO? Thank you for your help. Use the size 9 needles recommended. Cast on 87 stitches. I’m on row 17 and I don’t have any diamonds yet and I don’t kno if I should start over or not? You should have the beginning of diamonds. You won’t have complete diamonds until row 32. Wow, Just beautiful. I will be making this over the week end. With so many questions the other ladies had I hope I don’t have any problems with the pattern. Thank you for sharing a beautiful blanket. I started putting each rown on 3×5 file cards. When I finish a row, that card goes to the back. When there are multiple rows for the same pattern, I always know what row I am on. After handwriting them for several jobs, I started printing address labels and sticking them on my file cards. The blanket is gorgeous in the 2-toned color, but in reading the pattern there is no indication of when to change colors so the diamond stands out. Thank you for the alternate border using a seed stitch, my favorite. Waiting anxiousley for your help. It was all made in one color. The purl stitches on the front of the blanket stand out and give an illusion of being another color. Can you please tell me do you have a pattern for a matniee caoat in the King Charles Brocade pattern. Sorry, I haven’t written any coat patterns. Hi I have knoit the king chrles blanket and hat. Can you tell me do you have a matniee coat in this same pattern I can knit. I love your work. Although this takes time, if one puts each row on a 3×5 index card and removing that row to the back when finished with it, and then go on to the next row, one never looses track which row one is on. This has proven to be a valuable tool for me. If the pattern has several patterns witnin it, as an Irish knit, copy those also on an index card. I used this method to knot a queen size Irish knit blanket. Therefore, I had two sets of cards, one for the blanket itself and a set for each pattern within the blanket. I made this blanket AND the matching hat. They turned out beautiful! Thank you for such a great ( and free) pattern. I’ve been using Bernat Baby Sport for several baby afghans, and using two strands as I knit and it is wonderful….can’t wait to start this baby afghan…it is next on my list…and thank you Mama for your help given to others. Thank you so much for the print friendly version! You make knitting your pattern easy. Great-looking blanket! is the K3 K3 P3 K1 P1 K1 K1 ??? The asterisks denote the part of the row that should be repeated across the row. So for this row you would first k3, then you would p3, k1, p1, k1 then p3, k1, p1, k1 again and again until you get to the end of the row. Any stitches after asterisks are only made at the very end of the row. I am going to make this lovely blanket. Would 36. yards be enough to make the matching hat? Just curious. Thank you for sharing such beautiful patterns! You might get a preemie hat from that. A newborn hat will take closer to 50 yds. please advise type of yarn,needle size and color,it looks two tone, to use for knitting the King charles Brocade blanket. i wish to knit a delicate blanket to use at babys christing. The texture gives the two tone effect. I used a cotton with a sheen (Knitting Fever King Tut). It was actually a yellow yarn but washed out in the pictures. The more sheen the yarn has, the more the texture will show. I used a size 6 circular. what is DK baby yarn? please give yarn suggestions. These will be marked as #3 Light. Some of the most popular ones are by Bernat. the right side and row 10, the wrong (back) side. i like to mark the front and back so i can keep track of the rows. Correct. The odd rows are right side rows. Just love this pattern but as l am in Australia can you please tell me what ply wool to use and what size needles l need . Thank you. 8 ply wool and 4.00 mm needles. Love your pattern! Can’t wait to get started. I looked back at other posts and you mentioned you had knitted this with cotton. Would that be something like heavy crochet cotton such as Peaches and Cream? Love the way your sample shows such definition. I hope mine will, too! I used Knitting Fever King Tut cotton which is softer and has more drape than Peaches and Cream. King Tut also has a sheen that Peaches and Cream doesn’t have. I think you will still see the stitches, but they won’t we quite as pronounced as they would be with a yarn with a sheen. I’ve just done the first set of 32 rows but I had a problem each time with row 22, which is also row 32. I am making the large blanket and each time I do row 22 I cannot do a full repeat, I pearl the last 7 of the repeat then have to start again on the 5 k1 p1 before finishing with the p1 k3. What am I doing wrong? Adore the look of the blanket by the way but I’m a beginner knitter so I think it will be a Christmas present by the time I finish it! Sometimes it’s harder to see what is happening on those even rows because you are looking at the back of the blanket. On Row 21, the “p1, k1, p1″ forms the top of the diamond pattern. On row 22, when you are looking at row 21, it will be in the reverse and this portion will look like k1, p1, k1 in a field of purl. As you make the stitches for row 22, the “p1, k1, p1″ should be made in these three stitches. That will help you see if you have the stitches aligned correctly. Hi there! What a beautiful baby blanket you’ve shared. Please advise the number of stitches to cast on for worsted weight 4, size 8 needles, and how much yarn to make large size. I’ve knitted a bit, but am very insecure when it comes to adapting a pattern to different yarn. Thank you for answering questions so thoroughly, even when they are sometimes repeats. Cast on 135. Yarn amount is a little harder to guess, but probably just under 1,000 yards. Thank you for answering my probably repeated question. My wee grandson is due 8/29. I so hope to have his afghan done by the time he arrives. You’ve posted many lovely things and directions are relatively easy, even for me Thank you for your contributions and willingness to advise. Yay! My afghan is on the way. My daughter requested bold colors and while my choice for her baby is a bit muted, the definition you created will probably be less prominent. The yarn is variegated and since her preferences were less available in DK yarn, the finished product will differ. I’ll report back as to my experience. Mama, Thank you for your pattern and all your wonderful advise – all for FREE. Thanks for being so generous. I have been looking for an inspiration for an afghan and I think your pattern is the trick! I knitted a scarf in this pattern and love knitting it. Hat’s off to you for the inspiration to make it into a blanket! I have some beautiful wool and I like to make this blanket. However the wool is a multi coloured blend of pastel colours! Would the pattern leans it self enough with this multi coloured blend?? Lots of people on http://www.ravelry.com have posted pictures of this blanket made in variegated yarns and multi color blends. The pattern will not be as sharp and clear as it is with a solid yarn, but in their pictures I have still seen the diamond shapes. I love this pattern. I’m using it to make a baby blanket for my new niece (though I got the weight of yarn wrong…I got a light size 3 yarn but it seems to be working well so far.) Thank you for posting this pattern…this is the first non-strip project (not a scarf or afghan strip) that I’ve done, and I’ve found it very easy. I love this pattern but,having trouble with row 13 and also 29 as I have 99 stitches and doesn’t work out correct at the end.Not sure what I am doing wrong? There are 8 stitches before the repeated section and 7 after. The repeated section is 12 stitches. With a cast on of 99, the * section is repeated 7 times for a total of 84 stitches. With the total of 15 stitches at the beginning and end, that makes the 99 stitches. An idea to see where it is getting off is to check where the k5 is falling since the other sections are harder to identify. The first k5 will be stitches 12 to 16 with the others being 24 to 28, 36 to 40, 48 to 52, 60 to 64, 72 to 76 and 84 to 88. That’s 19,.. so the repeat 12 plus 7 equals 19 not 21. I have correct #between each repeat 12 and correct # at both ends of row: 21/18. I don’t know your initial cast on, but you didn’t mention a problem with Row 24, so I assume it worked out correctly. All the cast on’s are a multiple of 12 plus 3, which works with Row 24. I don’t know what your initial cast on was but at the point where you should have a last repeat and the following 7 stitches to make, you should have some multiple of 12 plus 8 completed on your needle. When u say weave in ends what do you mean. This is a lovely blanket to knit and looks lovely apart from ends. I have never knitted a blanket before so am new to this. The ends being the yarn at the beginning and end and any that you may have from skein changes. Use a yarn needle to work these along under purl bumps on the back side of the blanket. I am going to make this beautiful blanket in white for my great grandson’s Christening. Is it okay to use straight #6 needles? Absolutely. For larger sizes it might be a bit tight when working on the ends, but as long as you are alright with that, it will work. It would do great in any weight. I used 8 ply for my measurements, so just adjust cast on accordingly. I had a lot of fun working this pattern, it turned out beautifully. I made it in size small, perfect for a newborn. I like to keep a couple blankies handy for giving as baby shower gifts and this one will be perfect for a boy. Thanks for the great instructions! Lovely work! Thank you for sharing the pictures. que veux dire le mot purl ? It is correct as written. Size 6 in the uk is 5mm can you confirm that is ok. They are correct that the UK 6 converts to 5mm, but I’m actually using US sizes where a 6 converts to 4mm. The mm size will always be the true size. 33.62 ounces converts to 953 grams, so 10 balls. Hello Mama, I have 4 weeks before my first grandchild is due & my daughter was promised a shawl by a relative. Unfortunately this promise has fallen through due to ill health. I love this pattern but wonder if it is possible to knit a circular shawl using it? How would you propose I adapt it to become cirular & what size would you suggest if I were to use baby double knit? Do you think it’s possible to finish it before the baby’s arrival in 4 weeks? Thank you so much. I think it would be much too difficult to try to convert this pattern to a circular shawl. I would recommend http://www.ravelry.com for pattern searches. You can filter on attributes and limit searches to free patterns. There are LOTS of knitted circular shawl patterns out there and surely one that would be close to what you are looking for. Good luck! I love this blanket! I’m a beginner and have only knitted one small blanket before this. I really want to use an organic cotton yarn. The one I’m looking at is bulky knitting weight and 3.5 sts=1″. The weight is 100g/109 yds. Would this work? Which size needle would I need and how many stitches should I cast on for a baby blanket? I’m so excited to get started, but a little nervous being a beginner. Hello, which size would fit an Australian baby cot knitted in 8ply? Thank you. It would be the large size. If the medium was working the small should as well. There are 24 less cast stitches in the small than the medium so the repeat is just done fewer times. You will have 9 stitches before the first repeat. Each repeat is 12 stitches. So at the end of the first repeat you should have just made the 21st stitch of the row. The end of the next repeat will be stitch 33, then 45, 57, 69, 81, 93, 105, 117. This last repeat will leave you with the 6 stitches at the end of the row to make the p3 and k3. I hope that helps. I would like to knit this blanket for my daughter who is expecting a little boy, but I would like to know, can I knit on normal straight needles, as I tried to knit something already on a circular needle and did not come right. Baby blankets should work fine on straight needles. Sometimes larger blankets are too scrunched and heavy on straight needles. I want to make this blanket and am not a very experienced knitter. I can’t work out how much wool I need for the medium sized blanket. The DK merino wool I like comes in 50g balls or 1.75 ounces. If I need 19.11 ounces of wool it seems an awful lot of balls of wool and very expensive. Could you recommend another soft, washable wool I can use, or let me know if I have got it all wrong and tell me how many balls to buy! My ounces was based on cotton which is heaver than wool, so yardage is more accurate when using another type of yarn. That yarn has 130 yards per ball, so would take 8 balls for the medium. (8 skeins) to work with. Is 171 cast on stitches right for this? Cast on 159. This is the adjustment for the sightly larger gauge and will work with the pattern. For the large blanket? This is the Plymouth Encore worsted weight. I think it would be. It’s a little harder to estimate yardage when converting yarn weights, but would seem like it would be adequate. I’m trying to make the large version of this blanket for my daughter using Lionbrand Homespun bulky 5 yarn, so I’ve adjusted the needle size and the total number of stitches to cast on as per the directions (CO 111 stitches with size 10/6mm needle), but for some reason the pattern isn’t working for me. I’ve gotten all the way to row 23 but I’m still not seeing the beginnings/middles of any diamonds. Is it possible that the yarn I’ve chosen will impact the pattern? I’ve never had this issue before with choosing whatever kind of yarn I want and then just adjusting the gauge as needed… I love both the pattern and the yarn I’ve chosen, so not sure what to do or what I might be doing wrong!!! I’ve made a lot of projects with Lionbrand Homespun and my experience is that simple knit/purl texture patterns get lost with it because the yarn is so textured. I usually made patterns with cables because that was the only thing I found to be distinct enough to be apparent with that yarn. That’s what I was afraid of Thanks for the response… I’ll look for another type of yarn! in helping how many stitches to add with my yarn choice. Beginner Knitter – love this pattern (thank you for sharing), and want to try making it. I have not yet learned how to knit on circular needles, so I am going to use straight needles. Could you advise what size needles to use for the small and the medium blanket? You can make these on size 6 straight needles, especially the smaller sizes. The larger sizes might start to get crowded but still can be done on straight needles.